Learn about the temperament and personality of the Australian Cattle Dog. Discover what he's like to live with, his traits and characteristics and how he generally behaves. And look at lots of Australian Cattle Dog photos. The Australian Cattle Dog is not your everyday dog. They were bred to herd cattle, and they are immensely strong, energetic, and smart. They have a very strong personality and in order to be happy, will need an owner who is just as strong and stubborn as they are. 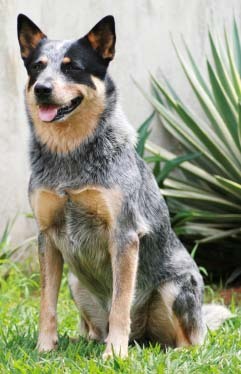 Once this match is made, the Australian Cattle Dog excels at obedience, both in the ring and in real life. They are obedient, but bold. They want to please you, but they also think for themselves. They respond quickly to their master's signals and commands. Australian Cattle Dogs need to be exercised both physically and mentally. They do best in working environments, and if they don't live on a farm, they will need something else to do. They love to be put to tasks that require them to think. A bored ACD will be very destructive and will destroy your house. They excel at agility, flyball, herding, and Frisbee competitions. They also make excellent jogging, hiking, biking, and rollerblading companions. They also enjoy a good game of fetch. Australian Cattle Dogs bond closely with their owners, once the owners have earned it, and become remarkably loyal companions. For this reason, they do not like to be left alone for hours at a time. They are protective of their family and property. Some are particularly suspicious of strangers, so early socialization is important -- you do not want your dog biting the Avon lady. They can do well with other dogs and cats if they are socialized properly. Australian Cattle Dogs love children, but it is a delicate situation. ACDs were bred to herd, and use their mouths to do so. They will nip at the heels of children. Early training with an experienced trainer is necessary to curtail this behavior, but even then, there are no guarantees. A "nip" from an ACD is not a serious injury, but it causes serious pain to a child, and is not acceptable. Also, if another child is roughhousing with your child, and your dog sees this as abuse, he will protect "his" child, which can be a serious liability. They may also nip you in moments of excitement. And while this is not dangerous in itself, your dog will have to be taught that he cannot use his mouth on people. He will try to herd anything: you, animals, your neighbors, and cars. They will chase cars. They are fearless animals, and thanks to their high pain tolerance, have been called "the rugby players of the dog world." They are also said to have a great sense of humor. The temperaments of Australian Cattle Dogs can vary as much as the temperaments of people, but all ACDs have incredible energy levels, all have free spirits, and all of them will make you the center of their universe. His attachment to you will be intense. He will follow you everywhere you go and want to be part of everything you do. The Australian Cattle Dog is a very heavy shedder. He sheds an awful lot of hair! You'll find hair all over your home, stuck to everything! You'll probably even find it in the butter!